The Boston Arthritis Walk will take place on Sunday, June 24, 2018 at Canal Park in Cambridge. Walkers can chose between a one-mile or three-mile route. Registration begins at 9:00 am, with the Walk starting at 10:00 am and festivities ending at about 1:00 pm. "It's no secret walking is simple, inexpensive and one of the best forms of physical activity for overall health and well-being. But for 46 million (1 in 5) adults with arthritis and many more at risk, walking is crucial to preventing and managing the nation’s leading cause of disability. In fact, the Arthritis Foundation says Americans cannot afford not to get moving. This year alone, nearly a million people will be diagnosed with arthritis. In addition to causing pain, disability and loss of independence, arthritis exacts a hefty financial toll on the country. The Centers for Disease Control and Prevention estimates that arthritis costs the U.S. economy $128 billion annually. Of the 46 million Americans affected by arthritis, most often overlooked are the nearly 300,000 children who are also affected by the disease. Juvenile Arthritis (JA) is one of the most common chronic childhood diseases, yet it often goes under the radar undetected or misdiagnosed. If left untreated, irreversible joint damage may occur. There are more children with JA than juvenile diabetes, a much better known disease. Walking is one of the easiest, safest and most beneficial forms of physical activity for most people, and a little effort goes a long way," said White. "Walking as little as 30 minutes – even 10 minutes three times a day – can ease joint pain, improve mobility and reduce fatigue. Walking can help achieve and maintain a healthy weight and reduce the risk of arthritis. Losing just 10 pounds relieves 40 pounds of pressure on knees, and losing as little as 11 pounds may reduce joint pain and help prevent knee osteoarthritis. For those already living with arthritis symptoms, losing 15 pounds can cut knee pain in half. Starting a walking program can seem like a daunting proposition. It’s important to start slow and make it fun. 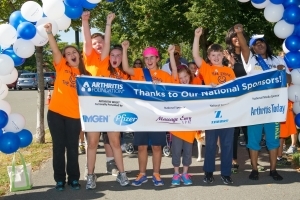 Thel Boston Arthritis Walk is a great way to kick off a new walking habit while raising much needed funds for arthritis research and community programs for both adults and children with JA. The Arthritis Foundation is the leading health organization addressing the needs of some 46 million Americans living with arthritis, the nation’s number-one cause of disability. Founded in 1948, with headquarters in Atlanta, the Arthritis Foundation has multiple service points located throughout the country. The Arthritis Foundation is the largest private, not-for-profit contributor to arthritis research in the world, funding more than $380 million in research grants since 1948. The foundation helps individuals take control of arthritis by providing public health education; pursuing public policy and legislation; and conducting evidence-based programs to improve the quality of life for those living with arthritis. Information is available 24 hours a day, seven days a week at 1-800-568-4045 or arthritis.org.